With warming temperatures, White Birch is ramping up its preparation for summer. Our tasting room is now open seven days of the week and will soon feature over a dozen wines to enjoy. Our winetail list is ever expanding, with a wine float in the works for hot summer days. With our white wines hitting the shelves in a few weeks, the reds are expected to be on the shelves by summer’s close. The season is starting to jump into full swing with shoot growth tripled since this photo taken May 25th . 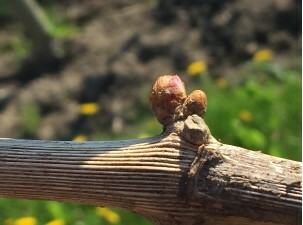 The weather has been dry helping ease early pressure from the fungal spores that like tender vinifera shoots and leafs. We did get a bit of rain followed by hot sunny weather that pushed the vines and weeds into full gear. Julio, our other full time vineyard worker, and I have been moving dirt to disrupt the weeds from growing over the past week. 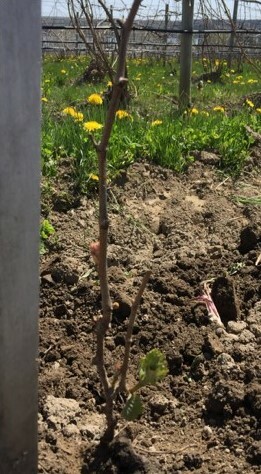 Soon it is time to tuck the shoots into the wires and tie the new shoots from the base of the vine up so they do not lie on the ground. Stay tuned for an updated picture that shows what a week’s worth of growth can be. 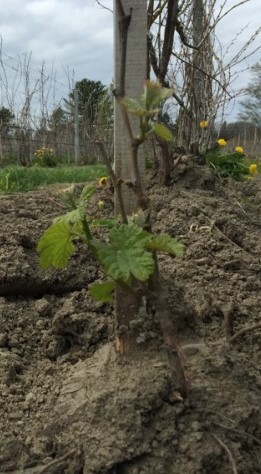 The younger vines are pushing their way to the fruit wire. 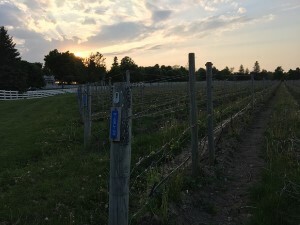 The vines in the pictures were planted last spring and should produce fruit in a couple seasons. Vines can be injured in various ways; the most common over the last few seasons has been the cold temperatures. Currently we are pruning out the old wood to promote the growth of the buds we had covered with dirt. After the old wood is pruned we tie the canes to the fruit wire to try to control the placement of the fruit. If the fruit is not uniform in the fruit zone it is hard to manage the fruit throughout the season. The grapevine buds are compound buds each containing three buds. The primary bud contains the most flower clusters, the secondary fewer clusters, and the tertiary bud contains no flower clusters. The three buds are varying in cold hardiness. The primary bud is least cold hardy, the secondary is a bit hardier, and the tertiary is most cold hardy. The picture above is of two of the three buds pushing out of a cane that was buried in the dirt. In regions where the temperature does not damage the buds, the secondary and tertiary buds are normally plucked off early in the growing season to prevent crowding of the fruit zone. The weather has continued to be dry enough to keep moving soil back to the aisle. In the back and forth passes up and down the aisles certain things stand out. Notice the picture of the vine with a rock stuck in the trunks. This picture tells a story of the site and previous seasons. I will point out a few of the more notable ones. First, the rock stuck in the trunks from the hill up plow moving dirt to cover the most susceptible areas to cold damage. 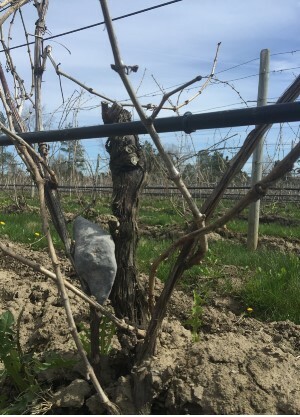 As the dirt was plowed to cover the vines, a rock got lodged in a couple of the trunks. Quick location lesson: in cold climate regions growers use “spare parts viticulture” which is multiple trunks of varying age. The reason for this is that if one or two trunks are damaged, there are still options for the vine to produce fruit. The biggest trunk in the middle is one that needs to be removed and a younger one will replace it. The biggest trunk is around 4 year old wood; the next biggest canes that are brown are two year old wood; the thinnest lightest colored canes are one year old and will have buds that produce fruit. Remember, fruitful buds come from one year old wood.